The Dublin Regional Homeless Executive found that 1,233 families were residing in emergency accommodation at the end of 2018. 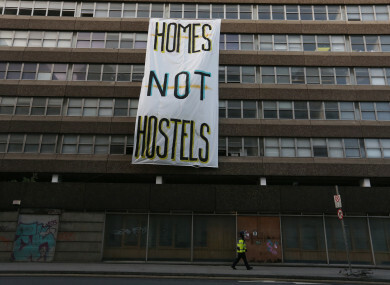 'Homes not Hostels' banner hanging outside the Apollo House that was occupied by groups protesting the homelessness crisis. NEW FIGURES SHOW that 144 families had been living in temporary emergency accommodation for over two years as of the end of 2018. A total of 1,233 families were residing in emergency accommodation facilities on 31 December 2018. Of these, almost one quarter had been living in emergency accommodation for at least a year and a half. The Dublin Regional Homeless Executive (DRHE) carried out the research by doing a count of families staying in temporary emergency accommodation on 31 December and asked the families how long they had been there. Emergency accommodation options for those facing homelessness include hostels, B&Bs, hotels, shelters and family hubs. Family hubs, which have cooking and laundry facilities and play areas for children, are specifically designed with the goal of families not staying in them for longer than six months. They are subject to service level agreements between local authorities and service providers, and the Department of Housing told TheJournal.ie that these contracts “require that families accessing the hubs are supported to exit to an independent tenancy within a six month period”. Commenting on the scale of the problem, Focus Ireland director of advocacy Mike Allen said that “over 500 of the families in commercial hotels do not even have a designated case manager to assist them to deal with the problems they face and support them to move out”. “So it is not surprising that many of them get stuck,” said Allen. Independent Dublin City councillor John Lyons, who requested the figures from Dublin City Council, said that the numbers are “pretty frightening”. He said more and more people are being “squeezed out” of the private rental sector due to increases in rent. Lyons had also requested information on the length of stay of families living specifically in family hub homeless accommodation from the Dublin City Council Chief Executive. This information was not provided. There are currently more than 368 families living in family hub homeless accommodation, Chief Executive Owen Keegan told Lyons. Keegan did not elaborate on the length of stay of the families as this “would require a record by record search”. Lyons said this is why families are stuck for so long in this accommodation – “because they’ve nowhere to go”. In these settings, these institutional settings, they become incrementally dependent on the arrangements in place, so they are very damaging. A Maynooth University report published in 2017 showed that family hubs “restrict the capacity to live normal lives and have devastating impacts on family, adult and child wellbeing”. “The primary response to growing homelessness in Ireland has been to build more and more emergency shelters and family hubs,” said Mike Allen. Reasons why families “get stuck” in emergency accommodation are complex, said Allen. The DRHE count found that 220 families had been in emergency accommodation for between a year and 18 months and 290 families had been living in the facilities between six and 12 months. 483 families had been there for less than six months. Separately, there were a total of 1,736 individual adults living in emergency accommodation on 31 December. 187 of these people had spent over two years in emergency accommodation. 627 had spent less than six months in the accommodation facilities. Allen said that many families are too far down the list for social housing and are further discriminated against by private landlords when seeking HAP tenancies. He said Dublin City Council has resisted “effective” strategies such as ensuring a stream of social housing allocations for families who would otherwise be trapped. Allen said the council would fear families deliberately making themselves homeless in order to access the help. He said there is “no evidence that well designed programmes to help the most vulnerable generate significant levels of such behaviour”. Email “'A generation locked out': The families spending more than two years in emergency accommodation”. Feedback on “'A generation locked out': The families spending more than two years in emergency accommodation”.